New Houston mural alert! The art scene is always evolving at the corner of Leeland St. and St. Emanuel St. in EaDo. This massive block of murals boasts some epic snap worthy shots by Gonzo247, Shelbi Nicole, El Pez and now an inspiring one sponsored by Frost Bank encouraging the world to Opt for Optimism. This post is sponsored by Frost Bank, but all opinions are my own! 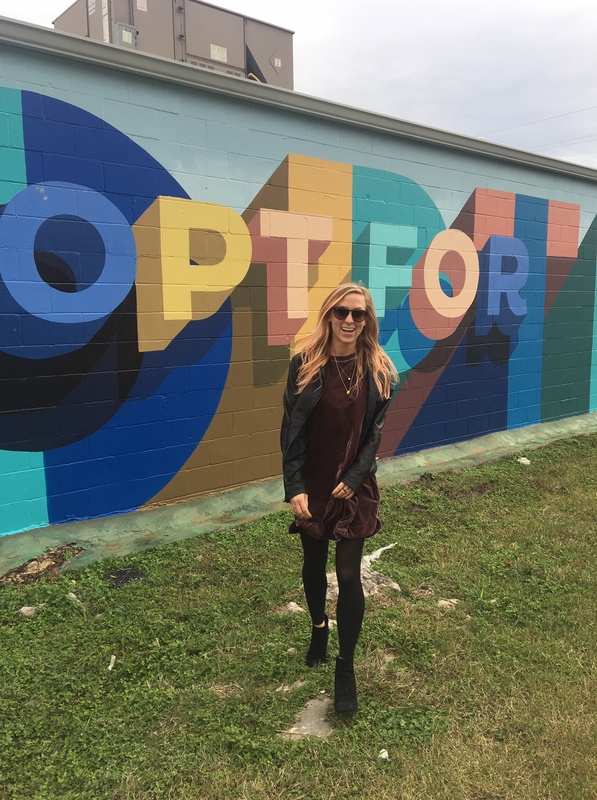 The new #OptforOptimism mural is up at 2011 Leeland St. The wall faces west, so it’s best to head there late in the morning or into the afternoon for the best pictures to avoid harsh shadows. As it’s part of the Houston Graffiti Building, there’s loads of parking and plenty of murals nearby for an afternoon photoshoot! I always like to take my out-of-town friends here for adventures. 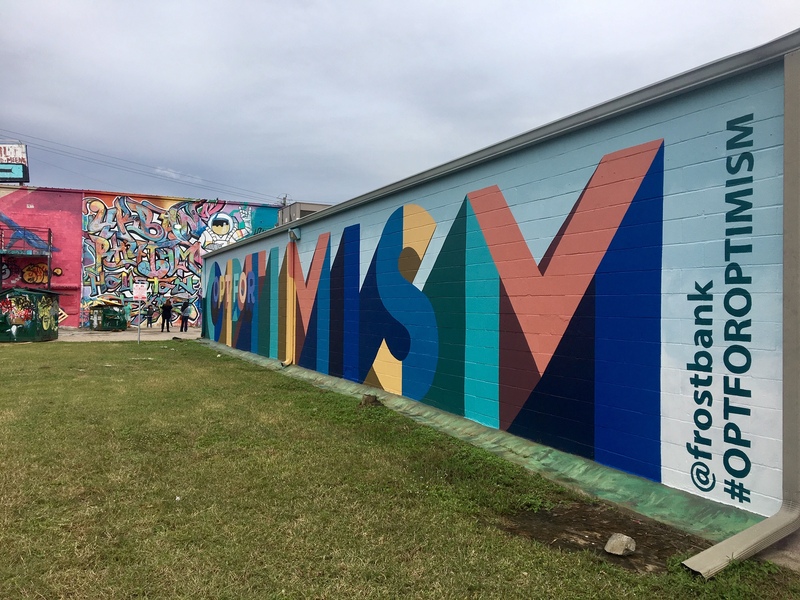 This new mural is an evolving iteration of the Frost Bank #FrostItForward campaign, which inspired us to do a random act of kindness and give back to the Houston community to help rebuild Buffalo Bayou on the anniversary of Hurricane Harvey. The city of Houston is such a generous town, and we’re so happy to be a part of it. We partnered with @frostbank and @culturemaphou to #FrostItForward with @buffalobayou! Hurricane Harvey devastated Houston and the park — taking 400 trees. We want to give back by planting a tree for future generations to enjoy! 🌳💚 Read more about the partnership through the link in our bio and swiping through our stories! 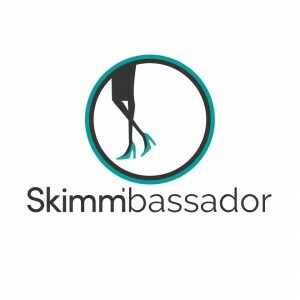 This new campaign is more accessible to the public and is the perfect excuse to have a glass half full mentality on life and inspire others to do the same! PLUS! On November 15th, Frost Bank is hosting a pop-up from 11:00am – 2:00pm. If you post a photo at the new mural for a chance, you have a chance to win $500 AND select a nonprofit that ALSO receives $500. So fun! Additionally, the Frost Bank team will be giving away a lot of treats that day from like pairs of tickets to Alamo Drafthouse, tickets to a Texans game, High Brew coffee and other goodies. You don’t want to miss out! Mark your calendar for the event, swing by for lunch, and don’t forget to use the hashtag #OptForOptimism and @frostbank when posting! For more Houston murals in the area, check out our 10 Walls to Visit in Houston in 2018 and 10 Walls to Visit in Houston in 2017! 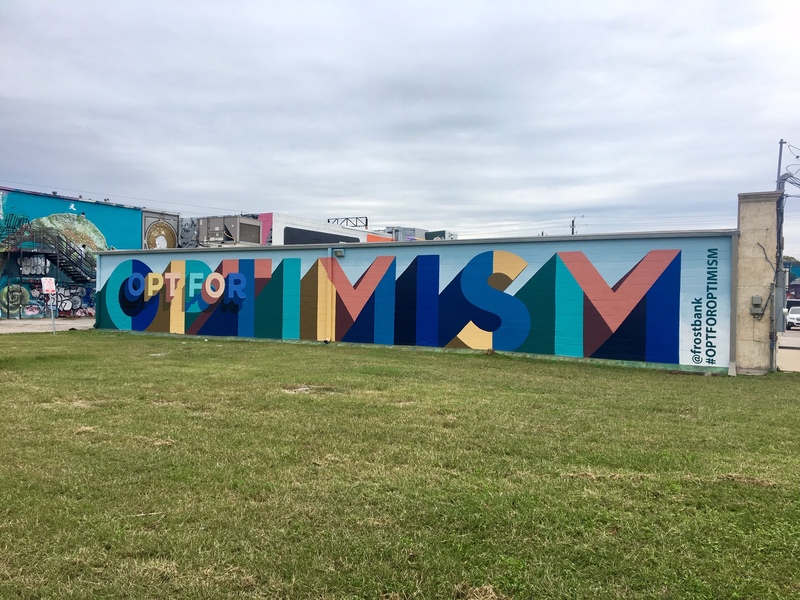 Tags: Art, EaDo, Frost Bank, Houston Mural, mural, Opt for Optimism. Bookmark the permalink.